Daniel Comments: Saw this stunning cover work at the book swap table in work. I hate to think what’s exciting him, but an up tuck would hide it better than a left tuck. I’d prefer a SINGED copy. At left: Jack Sparrow, captain of the Black Tomato. When Marvel Multiverse went wrong: Thor with Excalibur and Loki with a tea cosy on his head. “Highly appraised”, indeed. Followed by the sequel: The Forging of the Royalty Check. Thought for a minute that the space sheep had been replaced by Ottakar’s signed by the author stickers. Got to say though I am loving the swordsman’s quilted gilet. @Bibliomancer. 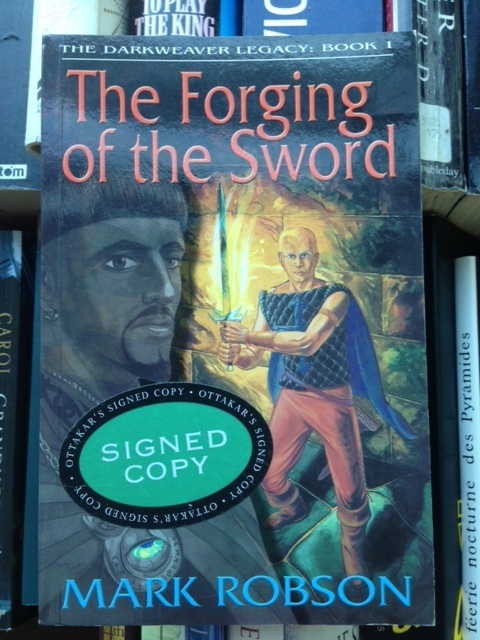 Someone has to get hold of that other edition featured on the “Sword Publishing” site, just for the, ah, *special* font – unless of course, “The Forging of the SVord” is an entirely different book. Sad to see the Eye of Agamotto slumming it in pre-teen fantasy. @Rachel J — Do you mean Thc Forcing or Thc Svord ? That edition is the mother of all font problems. New cover artist also. I suspect today’s cover art is a Mark Robson production also. On closer examination, Kirk Douglas’ vest is made of the polystyrene dimpled trays they use to pack apples in boxes, but with a crucifix on it. So he’s not just a Viking on a Crusade, he’s a Viking greengrocer on a Crusade. What’s going on with the guys arm… is that an extra joint or a shoulder pad? @SI: try that pose yourself! Shoulders rolled back, square, left arm across your torso. Your deltoid will form a capital D as well! @SI: I’m not sure that arm is even connected to his shoulder. It’s as if it was sliced through just above the biceps, but for some reason is still hanging there. For a weapon with a two-handed hilt, that’s an awfully short blade. Guess that’s what happens when you buy a forged blade instead of the real thing. Can i borrow those stretchy pants for Thanksgiving? If that’s the young protagonist Calvyn in the background, is that Hobbz in the foreground? Who the heck is Ottakar, and why would I want his signed copy? Why do I get the feeling that I would understand this perfectly if I lived in England? – The DARKBUSH…. oops, sorry, NSFW. It’s never a good sign for sales figures if you need add stickers to signed editions. Besides, is Ottakar really popular enough a name to warrant that? Hair is hard! Here’s a pro-tip, cover artists: put all your characters in hats or make them bald! Don’t miss ‘The Forging of the Sword”s sequel,’The Quilting of the Armor’, and the exiting conclusion to the trilogy, ‘The Trimming of the Bangs’! @JuanPaul I’m just waiting for it to be expanded into a quadrilogy with “The Tilting of the Floor”.